Looking to make the switch from a sitting desk to a standing one but haven't found the right option yet? 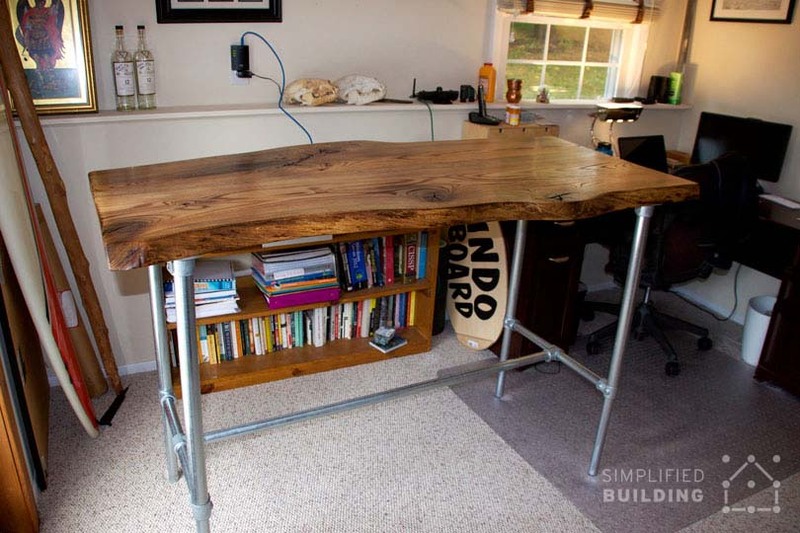 In this article, we'll show you 37 standing desk ideas that you can copy for your own home or work office. 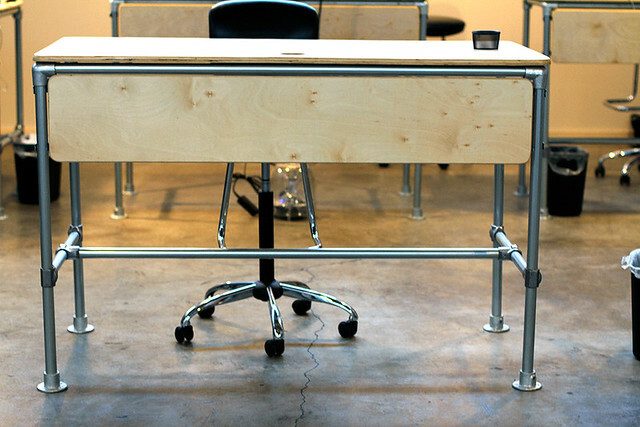 Each of these ideas utilize Kee Klamp pipe fittings and pipe to create the desk frame. 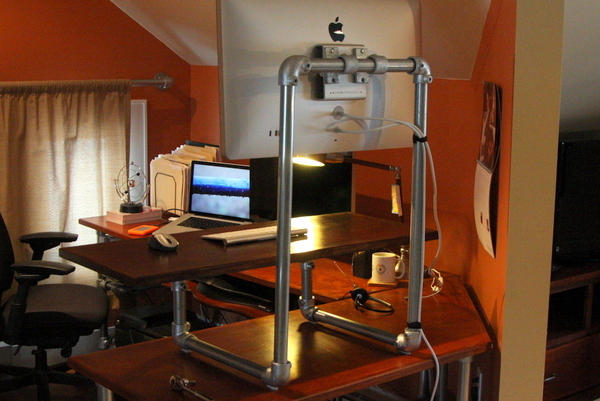 Pipe is a great option when it comes to building a standing desk. It Looks Great - Pipe has a great industrial look that adds a modern feel to your environment. 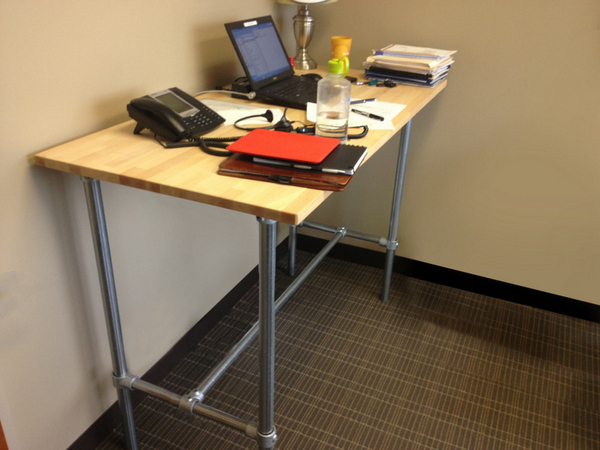 It's Customizable - Pipe can be cut on site or by the store to create a desk height that is an exact fit to your size. It's Easy to Build With - Building with pipe requires relatively little skill and only a few tools (as opposed to wood). 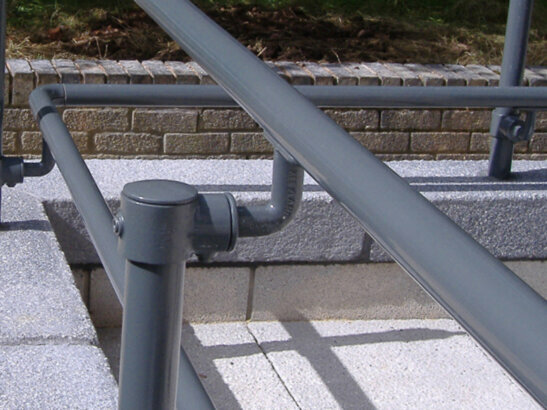 It's Solid - Pipe creates a rock solid base which can support a desktop of just about any shape, size and weight. 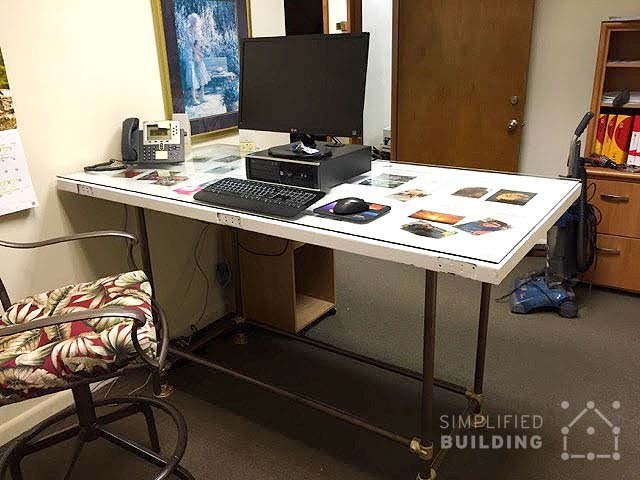 It's Cost Effective - Pipe and fittings may seem like a costly option, but when compared to other standing desks on the market or building it yourself with wood, I think you'll find its a very cost effective option for building a frame for your desk. Perhaps the biggest hassle when building with pipe is having to deal with the threaded ends and threaded fittings. Twisting the fitting into the right location and making sure both sides are level can be time-consuming and sometimes nearly impossible. The 37 projects listed below have all been built by our customers using pipe and Kee Klamp fittings. 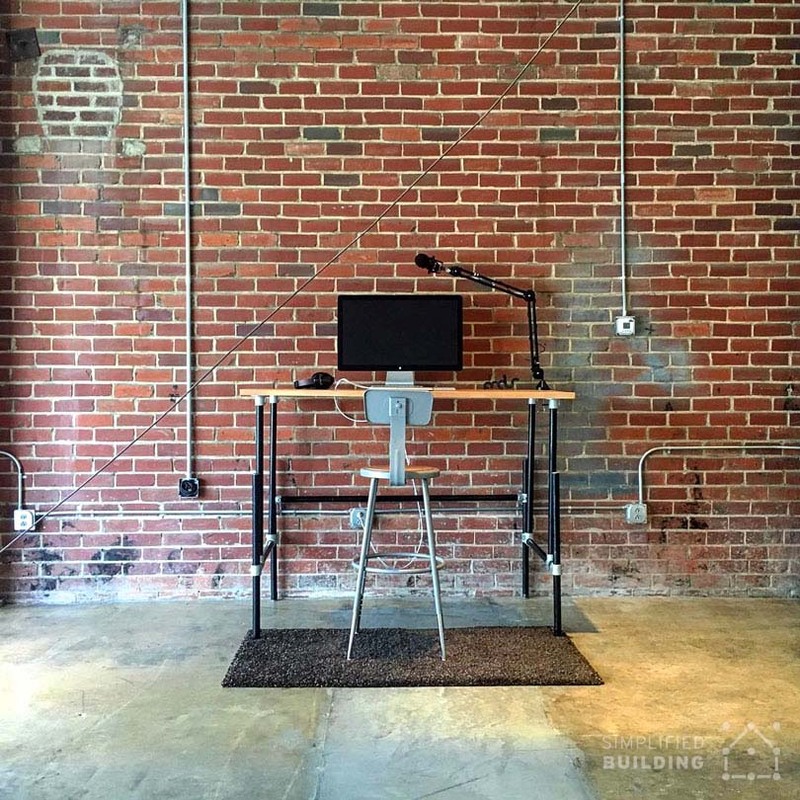 Be inspired by their work and build your own standing desk by selecting your own fittings, using one of our table frame kits or tapping into our project assistance. 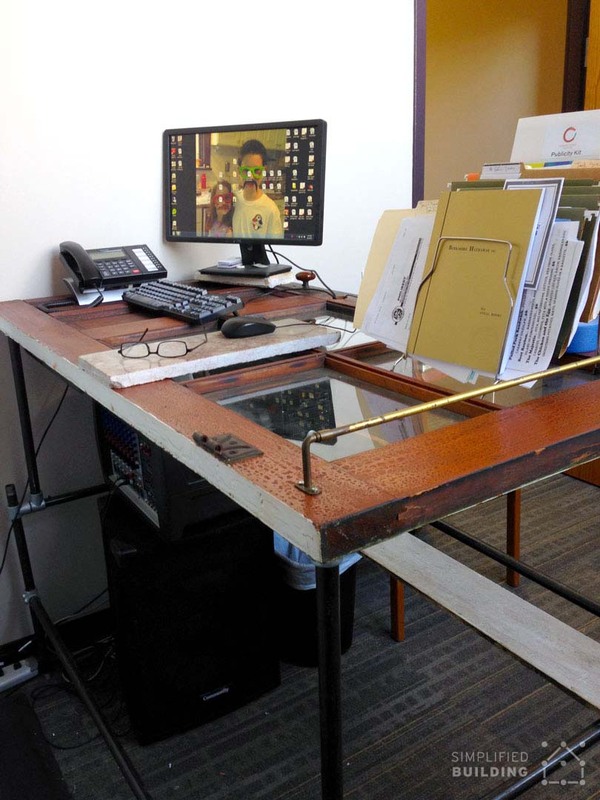 This live edge standing desk was built by Michael in Basking Ridge, New Jersey. The desk features a custom table top crafted from a slab of red oak. The board was slightly warped, but since Michael used Flange fittings to mount the board to the top of the frame, he was able to compensate. The fittings allow for a bit of play which enabled Michael to level the table. Brian used Kee Klamp as the base for the main desk and then used plumbing fittings to attach the shelf riser at the back of the desk. 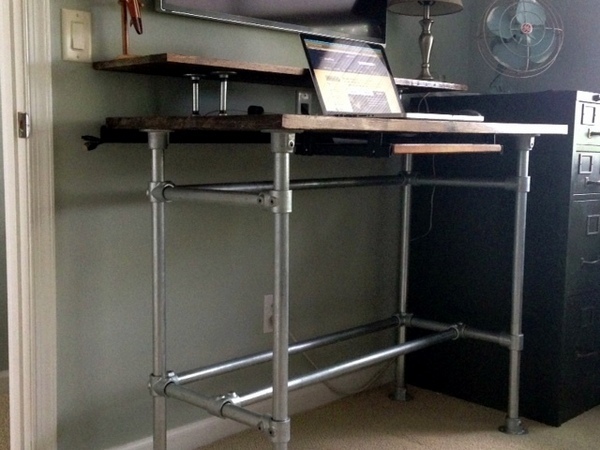 The frame of the standing desk is overbuilt to give it a strong, industrial look. 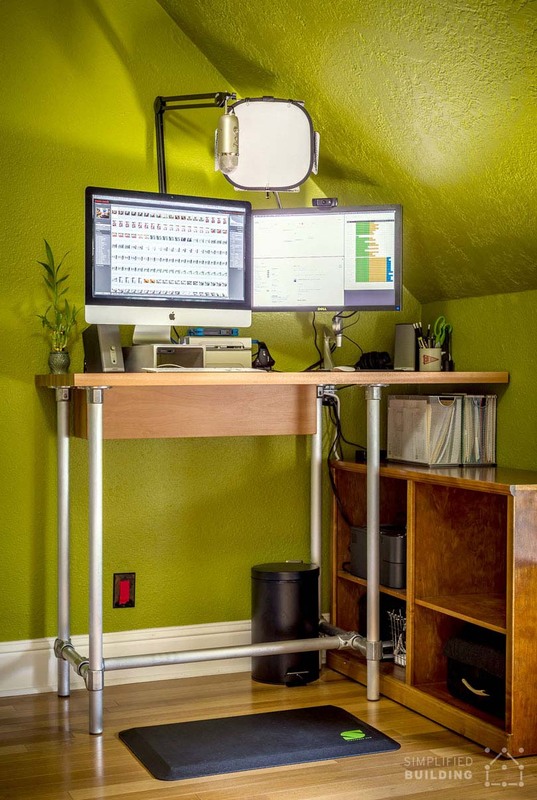 Brian's standing desk uses a configuration similar to this popular DIY standing desk. 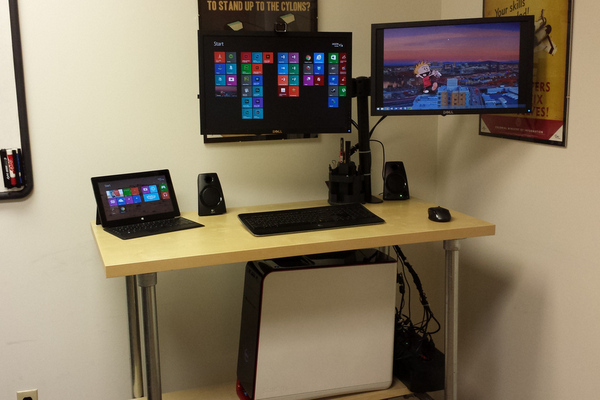 Chris, from Rochester, New York, used Kee Klamp to build a "sled" that supports a monitor and keyboard tray. He uses this as a "second space". He can move from his sitting desk to his standing desk with relative ease. Modeled from this "sled desk", the pipe and fittings attach directly to the VESA bracket in the back of the monitor. This desk offers great versatility. 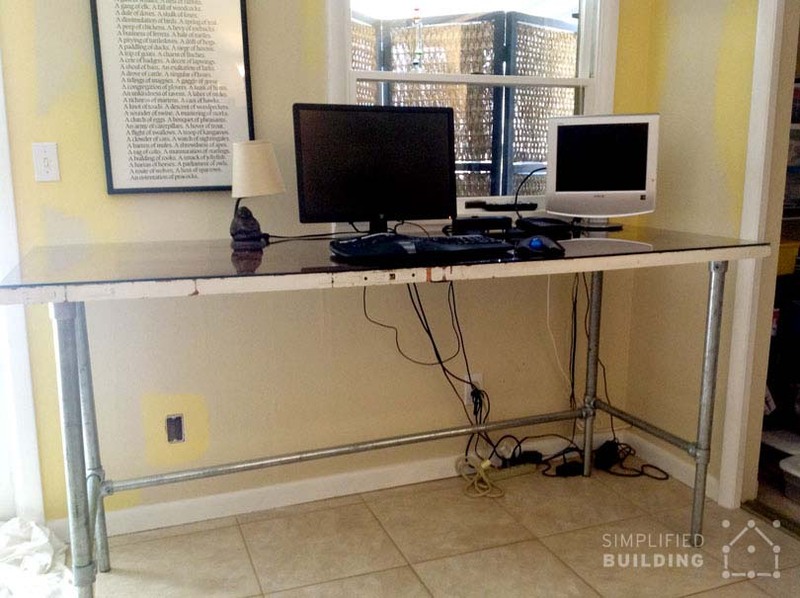 It can be moved when needed and makes a great solution for anyone who is trying to build a standing desk on top of an existing desk. Read more about this desk (and see complete, step-by-step plans) here. After struggling with hip, knee, and foot pain, Mason's therapist suggested he try a standing desk to help alleviate the pain likely caused by too much sitting. So Mason decided to build his own. The result is the fantastic desk you see pictured above. Mason loves the desk and says he uses it about 4 to 5 hours each day. He even went so far as to write a blog post about it, which you can check out here. If you you want to try out a standing desk, but aren't quite sure if you'll like it or just don't want to make a permanent commitment to standing all the time, I would recommend getting an adjustable height desk like this one. 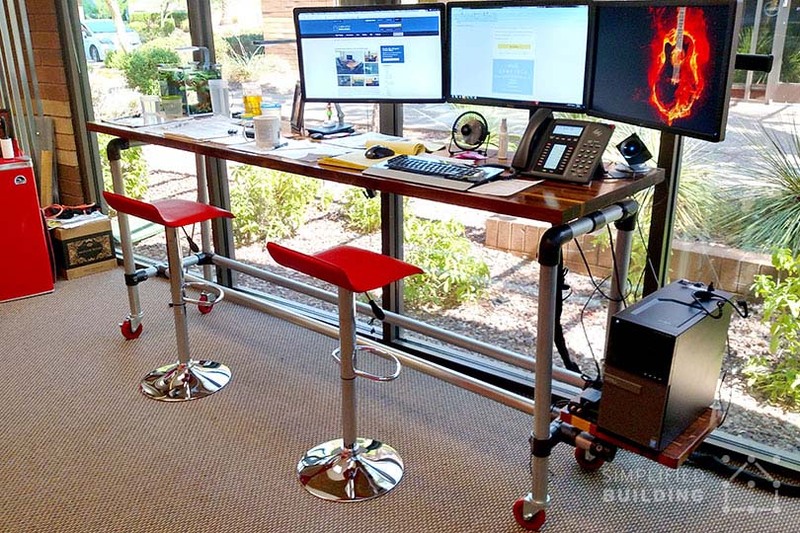 Because the desk frame uses different size, adjustable fittings, the desk can be positioned from sitting to standing height (and anywhere in between). Here's a video of the action if you're interested in learning more. 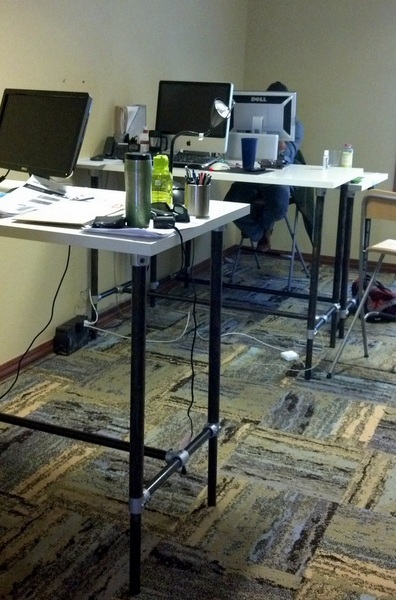 The standing desk pictured above was built by Gabe Diaz. This desk was actually his third project using pipe and Kee Klamp fittings. 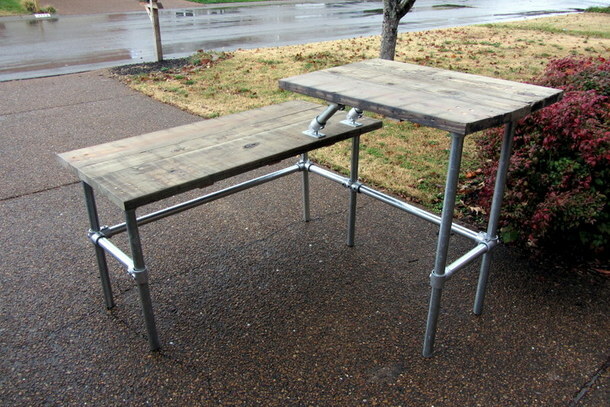 He built a coffee table and bed from pipe as well (check them out here). Gabe came up with the idea of having two different levels to his standing desk. The lower portion of the desk works as a working surface and the upper portion doubles as a shelf and a higher work area. 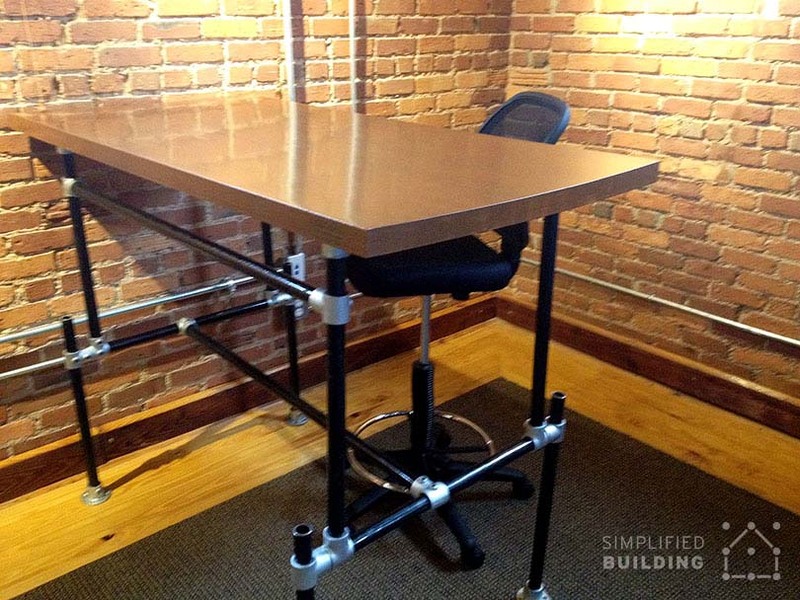 Building a standing desk to suit your needs is one of the primary advantages of using Kee Klamp and pipe. This desk is a great embodiment of that idea. 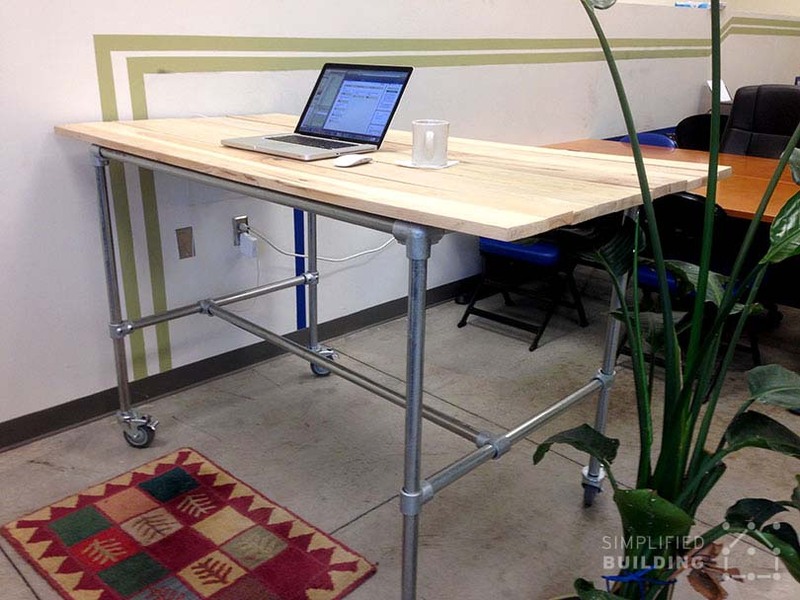 You simply won't find a standing desk on the market that looks like the desk pictured above. This customer wanted to have a spot for two separate computers and a long shelf underneath the desk to store books. He was able to build his own desk at a fraction of what it would cost to have something like this made by a carpenter. 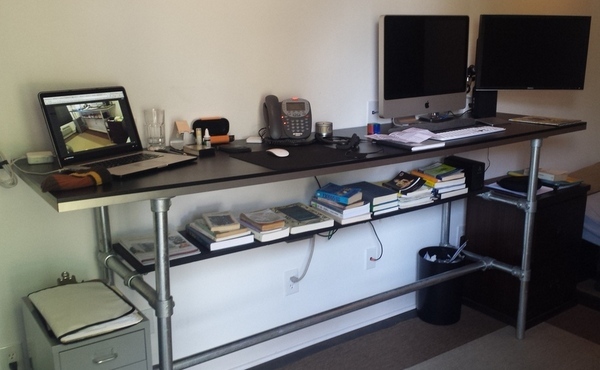 This standing desk was built by Richard in Brooklyn, New York. The frame features two horizontal bars that run across the frame. This allows Richard to stack storage boxes on top of these supports. 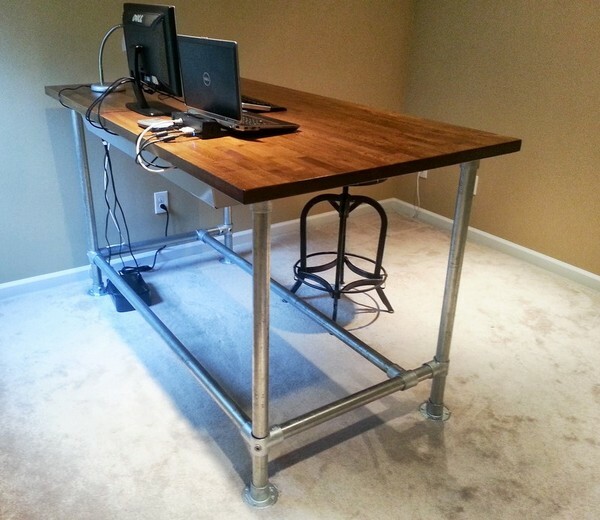 Looking for industrial pipe desk plans to build your own desk? In this article, we'll show you how you can build your own desk with detailed diagrams and steps. 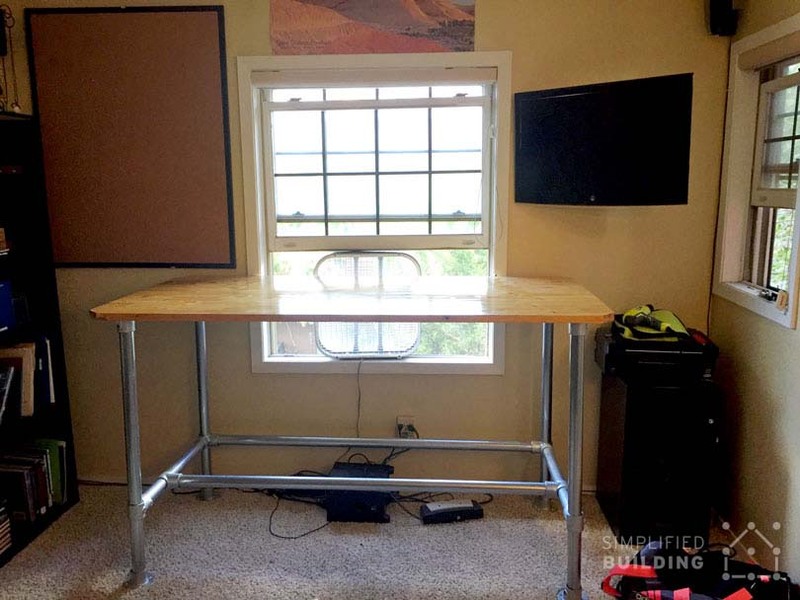 This standing desk was built by Michael for his home office. The desk features a hardwood plywood board used as the desk table top. 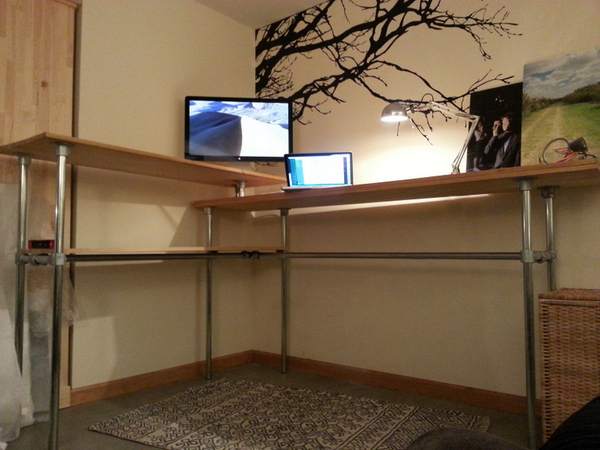 The desk is also positioned high enough to allow Michael to place a drawer underneath for extra storage. This beautiful desk is positioned at standing height yet makes use of a pair of stools so users can sit when their legs are tired. 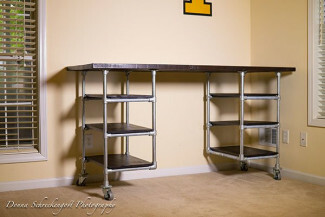 The desk frame incorporates a shelf for the computer tower to sit on and casters on the bottom of the desk frame legs to make it easy to move whenever necessary. "I wanted a sit/stand computer desk. However, I really dislike a few things about most computer desks these days. The big item is that there is generally no good place to store all the "stuff" that goes with computers except by piling it all on the desktop. For my desk, I build a large box, essentially, with a split top that lifts off to give me access to the interior. No drawers to snag cables, but I still had full access. Since wood is actually a decent insulator, I added some air holes and fans to keep the components inside the desk cool. I call this version my prototype since I built it to test the idea. I've used it for about 8 months now and I'm working on the next version." My buddy in my study group encouraged me to work standing up. I had already been exploring options. I went to many websites, called about half a dozen furniture people and finally found this option online. I didn't go with the adjustable option but the legs can easily be modified if I decide to sit again. The desk was pretty simple to put together even though I am not very handy. Thank you for posting the video and dimensions to your site! 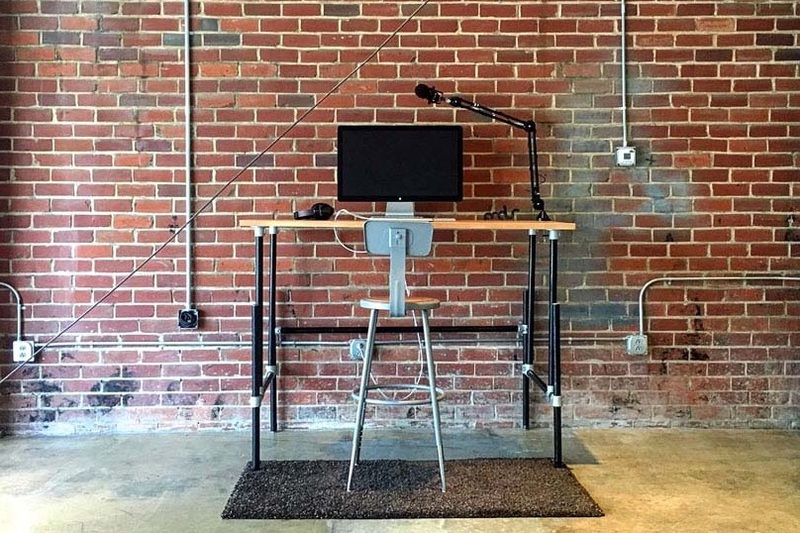 This standing desk was built by the crew over at Fort Foundry, a font design company in Athens, Ga. The desk frame features a unique design that allows the desk to be adjusted in height (so it can be positioned at sitting or standing height). 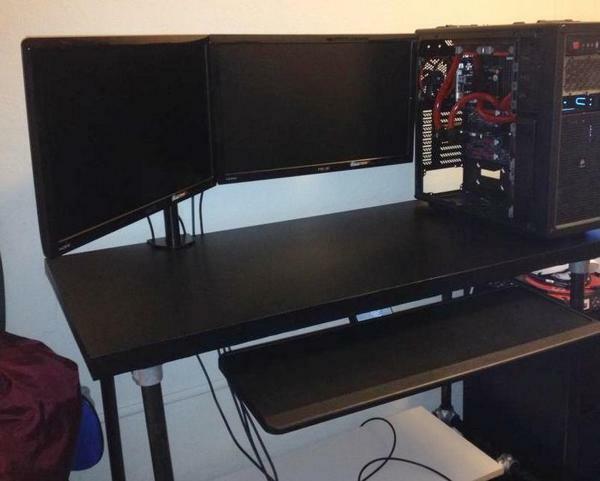 Marlon went all out to build this gaming desk. 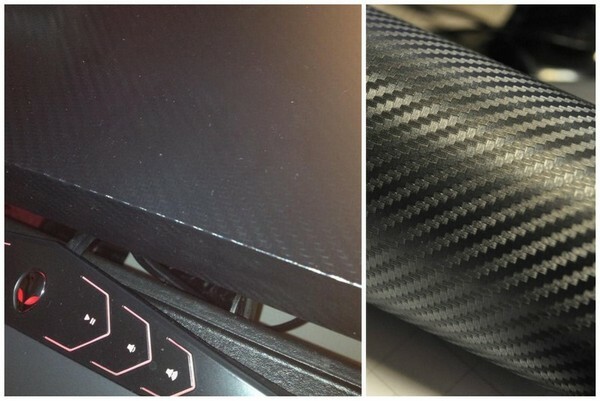 Using the same basic frame as this DIY standing desk, he coated a piece of fiber board in carbon fiber tape that he found on eBay. 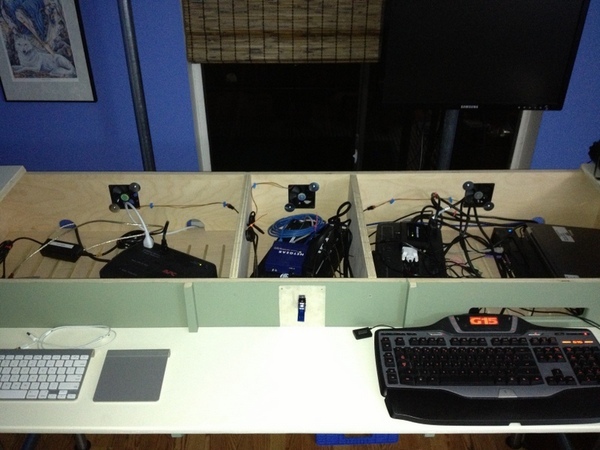 He added a keyboard tray and a shelf on the bottom of the desk. The black on black effect really makes the silver fittings stand out. Marlon says: "With the Kee Klamps everything is so easy to assemble and can handle heavy stuff. I'm so happy with my new desk." 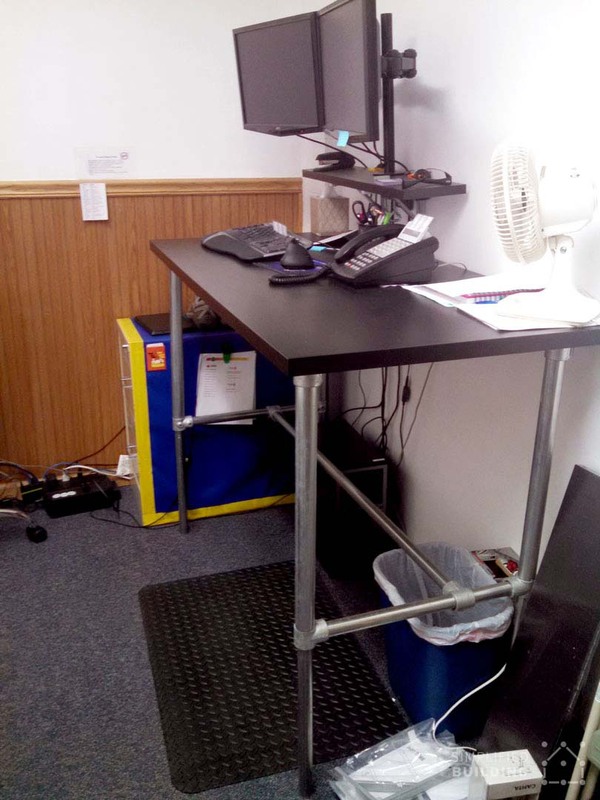 Standing Desk Built for those "On the Move"
Ladson, wanted to build a standing desk to enhance his studies. He used a Kee Klamp and pipe frame for the base and attached it to a pine top using carriage bolts. "I found a cheap pine table top online and cut it down to 60"x30" to be used as a standing computer desk and workspace as I begin engineering school. At first, I thought about how best to secure the table top to the frame itself. Wood screws were the obvious choice, but they did not seem most functional for long-term use if I needed to breakdown and move the table. So, I settled on counter-sunk machine bolts that matched the gator tubing and provided a nice contrast on the black painted wood surface. Overall, the table frame and table top connected together with the help of some shims where the underside surfaces didn't match up. Finally, I mounted a surge protector to the underside of the table to provide easy access for power cords." One thing that Ladson didn't realize before building his project was that Kee Klamp makes it easy to disconnect the top from the pipe frame. Loosening the pipe in the flanges attached to the desktop would have made the top detachable. People are moving around more than ever these days and portability is an added benefit. Standing desks built with Kee Klamp can be reassembled time and time again. The hardware is attached, making it more difficult to lose and because the components are steel they are not likely to be broken. 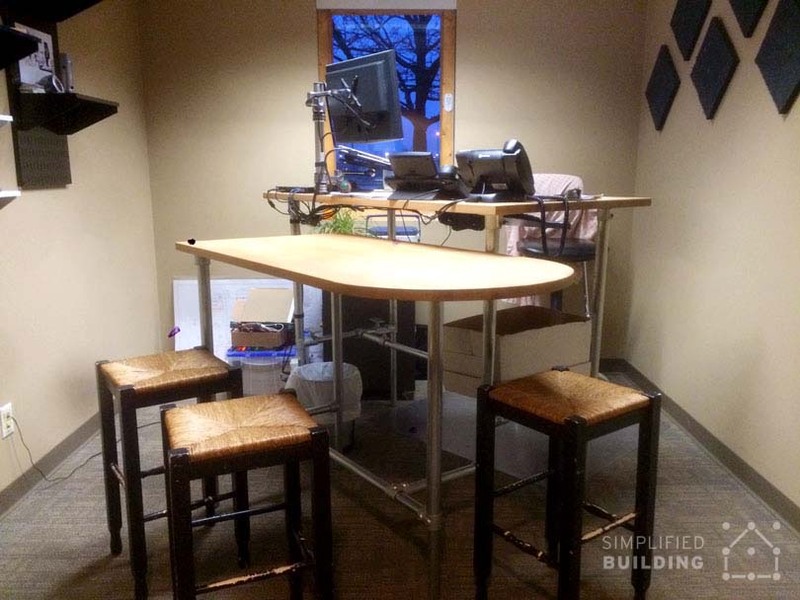 These standing desks were used to outfit an entire office. They used black pipe to present a contrasting color against the galvanized fittings. 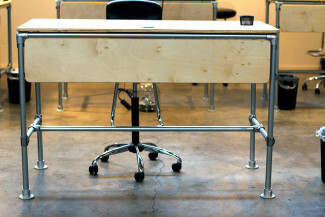 These desks look great and are a low-cost, highly-durable solution for office standing desks. 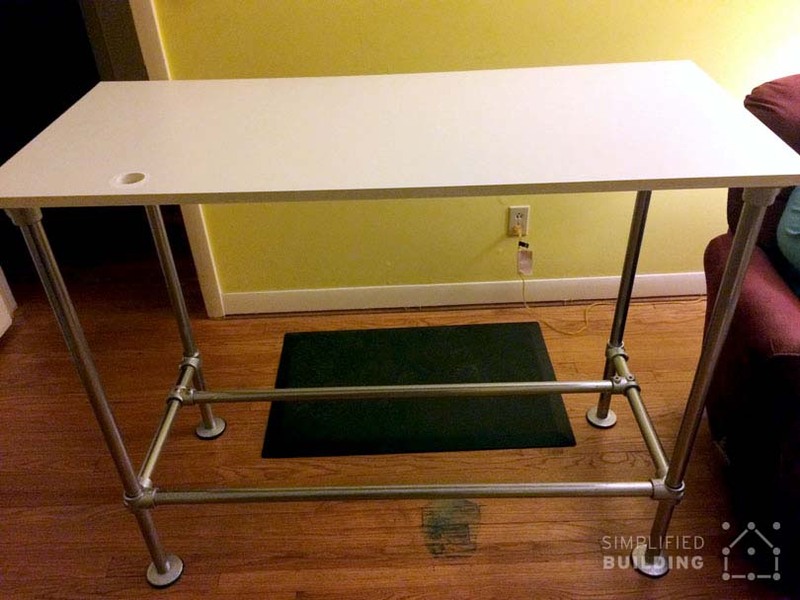 The basic table frame kit will provide you with the fittings and pipe you need to build this standing desk. 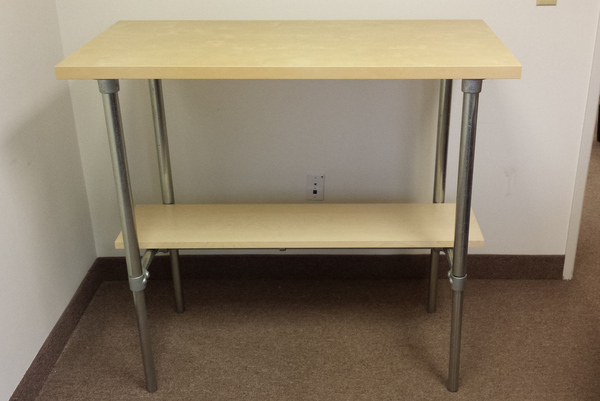 Another great option for standing desks in the office is our adjustable height table frame kit. 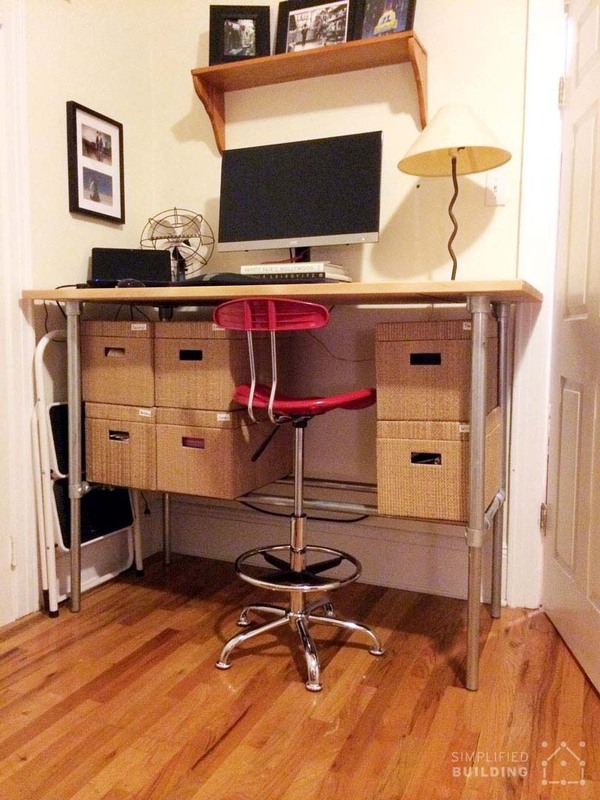 This kit allows you to build a desk that can be set in a standing or sitting configuration. It also allows for finite adjustments so that the desk can be adjusted to the ideal ergonomic height of the individual. 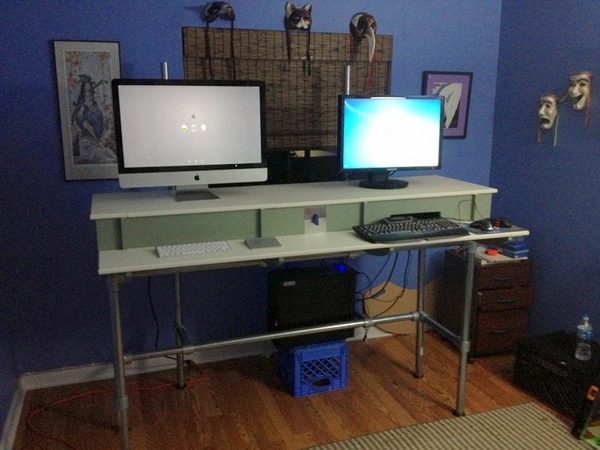 Jason Howie submitted these pictures of his DIY standing desk. 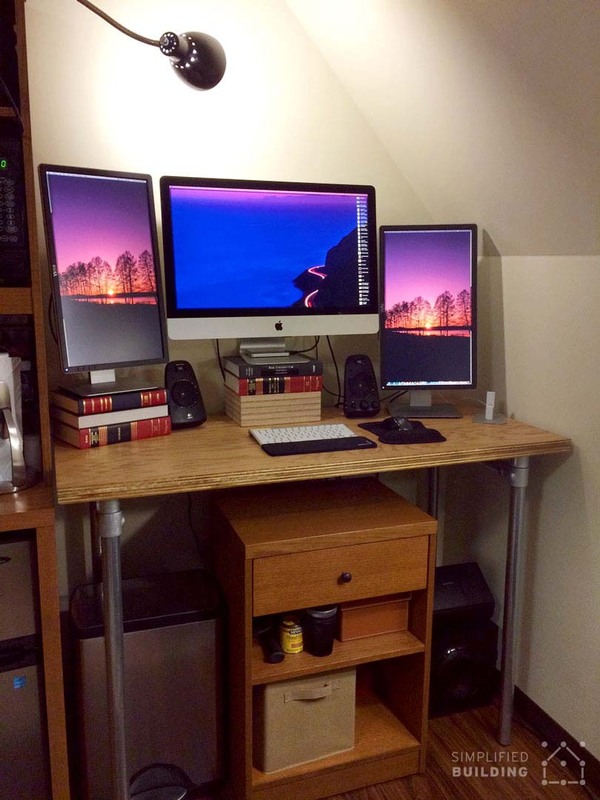 He used an IKEA shelf and desktop for his desk. 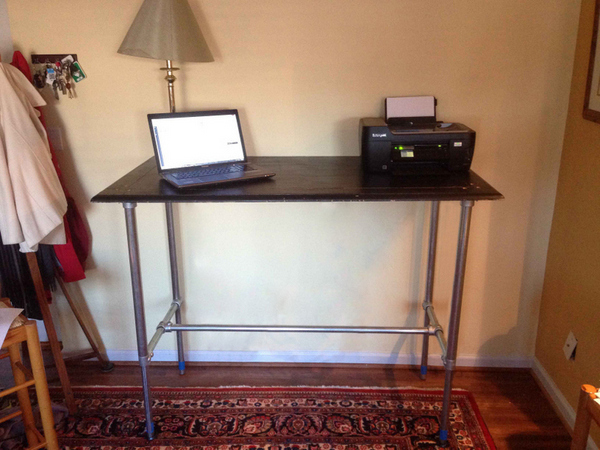 Jason did a complete write up on his standing desk that you can find on his blog. The above desk was built by Andrew in Greenville, South Carolina. The frame features a unique design that allows the table to be adjusted in height. The desk is seen here pictured at standing height but it could also be positioned at sitting height should Andrew ever decide to go back to sitting. 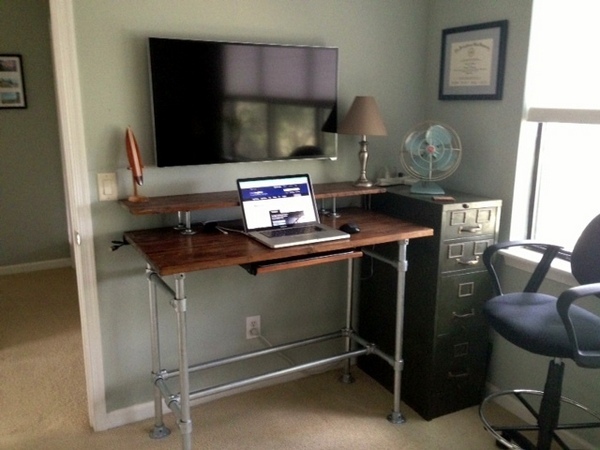 Brad in Westerville, Ohio built this standing desk for his home office. The desk measures 70 inches long and sits at 45 inches tall. "I am a member of Syracuse Coworks and we want to expand into a new bigger space. I built this desk as a prototype; if people like it, we will build 30 of them. We wanted a mobile standing desk that had a recycled wood top. We were searching the internet for ideas and I came upon the Maker Table Project, we liked the look and it seemed easy to build." "Easiest project I've ever undertaken. Also, your staff is excellent over the phone and in their follow up on e-mail." This desk was built by Guy in Venice, Florida. 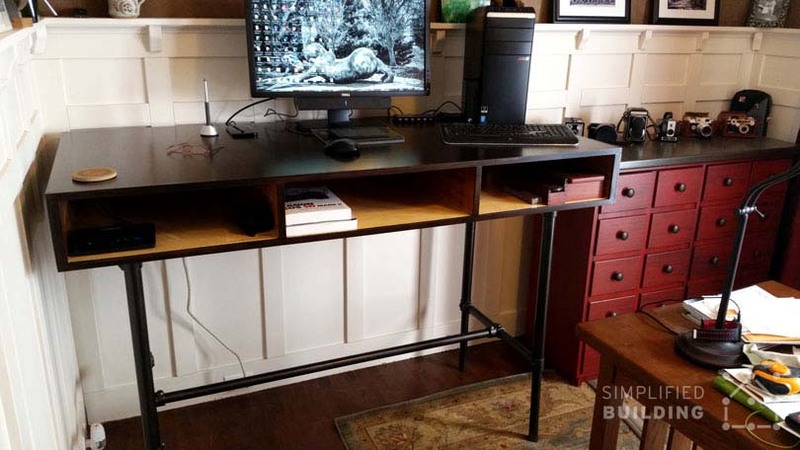 His daughter wanted a standing desk so Guy decided to build one himself. The desk features a weathered door that is used as the desk table top. A slate of glass is then placed over the door for a clean, level surface. The above desk was built by Lara in Tallmadge, Ohio. 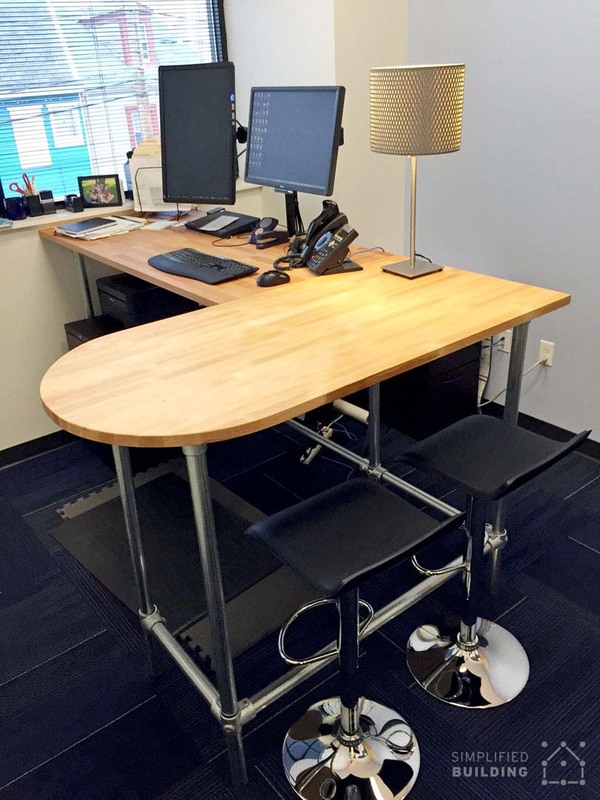 Lara is a Safety Coordinator at a manufacturing facility and wanted a way for her office's desks to be adjustable, ergonomic, and safe. While the desk is positioned at standing height, it is actually adjustable and can be positioned at sitting height. 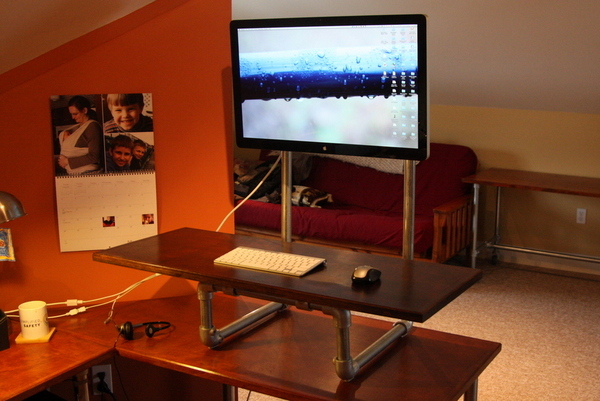 This is made possible using our adjustable height table/desk kit. 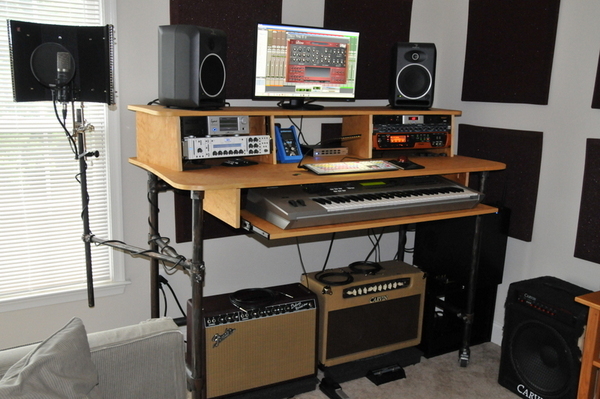 This desk was built by Brandon for his home recording studio. The desk features a pre-built table top to host all of his recording gear and the frame sits on casters to make it easy to move. Another unique feature of the desk is the integrated "microphone stand" (to the left). 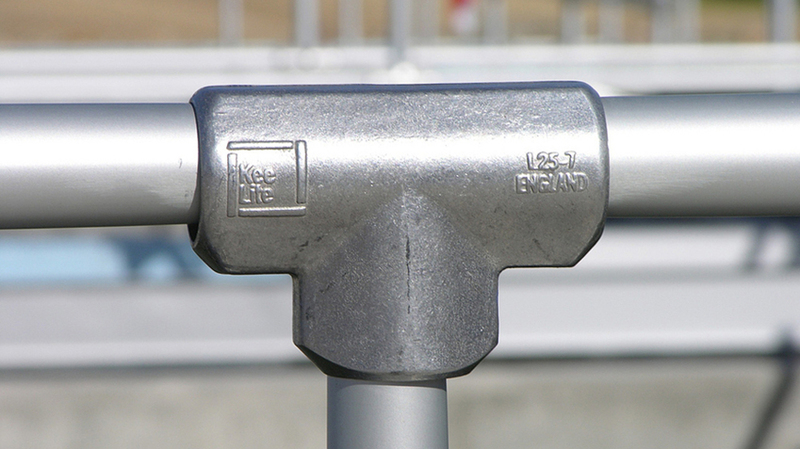 The stand is connected to the frame using a length of pipe and two Single Socket Tee fittings. This pipe desk was built by Louis in Boca Raton, Florida. It too, features a weathered door table top in combination with a piece of glass placed over top of the door. This helps to create a flat, even surface. 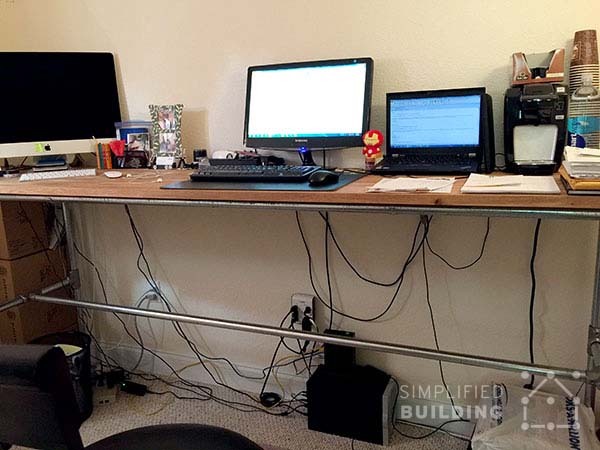 Mo built this standing desk for his wife after he adapted a set of plans he found on the Simplified Building Blog. It features a white table top and an extra brace at the bottom of the desk frame for added support (and to rest feet on). Mo appreciated the ease of assembly and industrial style of Kee Klamp. This unique desk was built by Randy for his home office. Randy actually has two desks in his office but uses this one to stand up while editing photos. The desk features a "sandwiched" top that allows for extra storage and the frame was constructed using our adjustable height desk/table frame kit (which can be adjusted from sitting to standing height and everywhere in between). "My desk has worked out very well for me and garnered much attention. I use the lower level as a conference table. I can swing my one monitor out and accommodate up to 4 additional people around the desk and table for meetings and we can all see a computer screen if needed. Thank you for your products." This desk was built by William in Gering, Nebraska. The desk features a butcher block table top paired with a Kee Klamp built frame. William appreciated the simplicity and ease of use when using the fittings to build the desk frame. Most of all, he appreciated that assembling the frame required no special tools (just an Allen wrench). "When our offices moved last fall and we were pricing new desks it dawned on me that I had been sitting at my desk for 10 years. 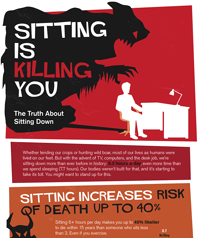 I started researching stand up desks online and discovered that it may be a healthier way to go over the long haul. I knew I could build something for far less than the new desks. In the end, I spent $113. I don't think I could find anything comparable in the way of your clamps." "I'm an architect based in New Orleans and I am interested in different ways of building. I saw Kee Klamp being used to build temporary structures at various events/festivals and thought it would be fun to try. I figured building a piece of furniture would be a great way to get familiar with the product before trying something more substantial...I like how everything is modular. I can add, subtract, or reconfigure the desk whenever I want. If I get tired of the desk, I can reuse the Kee components in another project. Best of all, they are extremely sturdy." 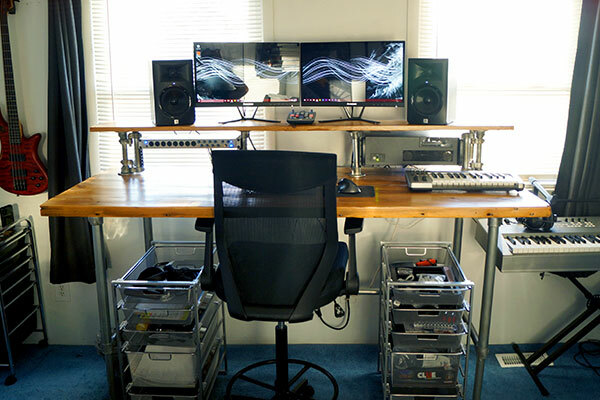 This L-Shaped desk was built by Scott in Pittsburgh, Pennsylvania. 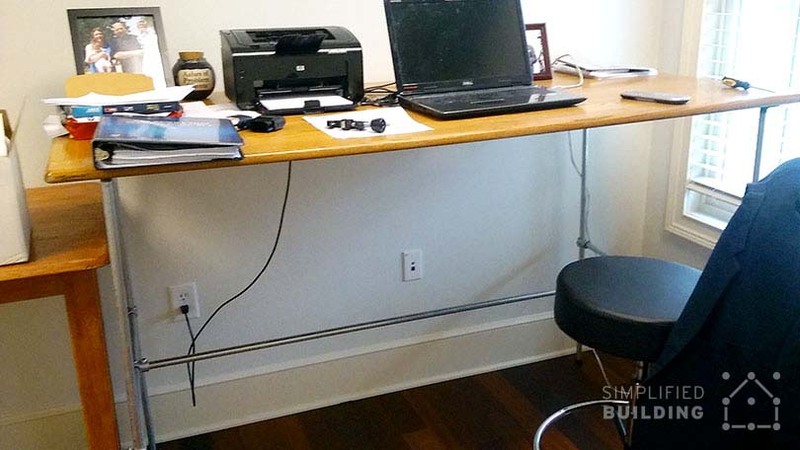 The desk features a horizontal brace at the bottom of desk frame that is made possible using the Single Socket Tee, 90 Degree Side Outlet Tee, and Two Socket Cross fittings. The desk table top in constructed from two butcher block tops from Ikea (this one and this one). "I've been wanting a standing desk for a while due to issues with my back. After shopping around and seeing the crazy prices, I decided to build my own. After reviewing the many ideas on Simplified Building, I realized that I wanted a larger desk for my home office. I started searching the internet and saw one built with a counter top from IKEA. It was nice but not big enough for me. After some research on the IKEA site I found the right counter top for me!" "We just moved into a new studio in Omaha's North Downtown district. Our building is very industrial, and we wanted unique, non-Ikea desks that stood out. We also wanted to have the option to sit or stand while working. We came across the maker's desk, and decided to go for it. 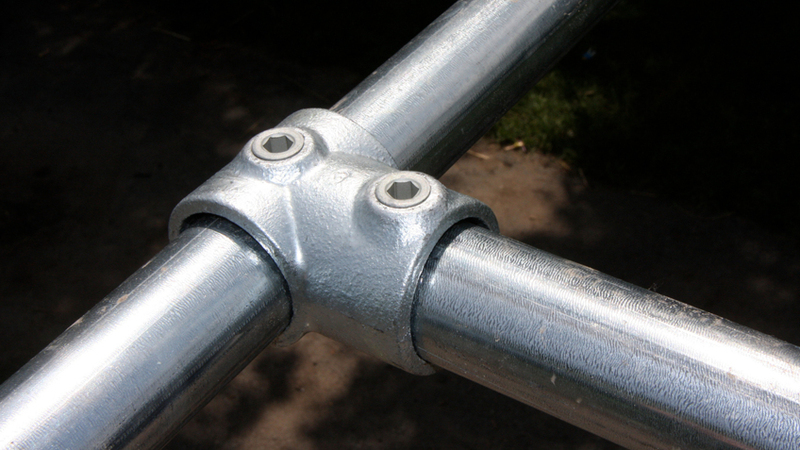 We built the frames ourselves, using fittings from Simplified Building and aluminum pipe from a local source. The wood tops & skirts were make by a local woodworking artist. We have two holes drilled in the top of the desk-one for cords, the other--well, let's just say it fits a pint glass quite nicely." This desk was designed and built by Bobby from Planksters. The desk features two levels: one that can be used while sitting and the other while standing. It's a unique combination that allows Bobby to mix up his position throughout the day. This standing desk is actually my personal desk that I use in my home office. I'm a musician and I produce a lot of music in my spare time, so I use the area to work on my craft. The desk features an added level for my two computer monitors and speakers. It also has casters on the bottom of the frame legs to make it easy to pull away from the wall to access the back of my computer and recording gear. Finally, the table top is actually built from an old, cedar barn door. Check out my full walk-through of this project here. 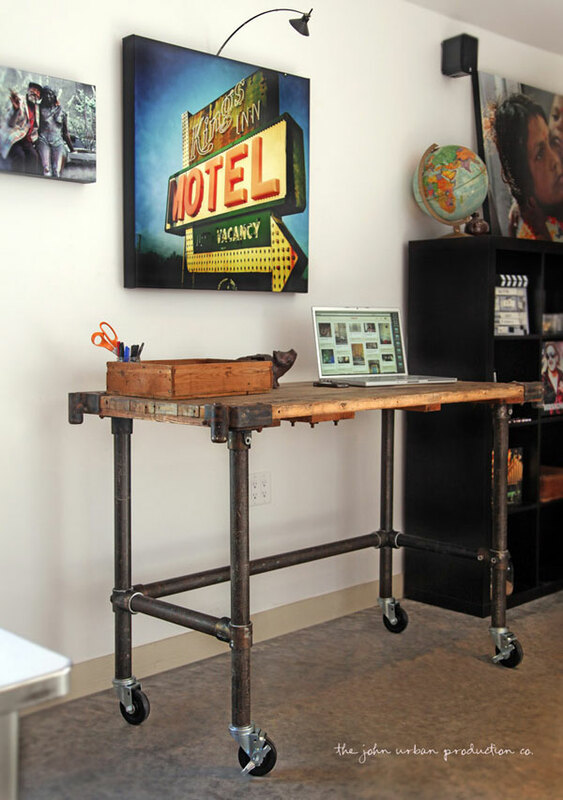 Vintage Standing Desk with "Antiqued Metal"
"I basically used what I had lying around, which was a small can of Rust-oleum "flat black" and believe it or not, a jar of Martha Stewart's metallic "cast bronze 350 592. No real method, just playing knowing I could put more layers on if needed. Ended up only being one layer of each with some little bare spots showing through." Read more about his project here. 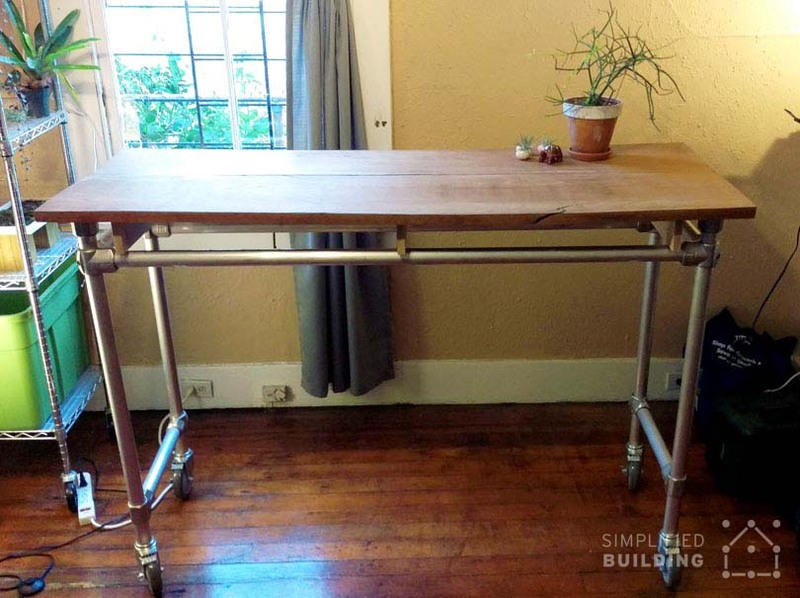 If you've been inspired to build your own standing desk with pipe and Kee Klamp you've got a couple different ways to move forward. If you're the creative type, just dig into our online catalog and build your dream desk with the fittings you find there. Check out our desk frame kits. They are a great place to start. 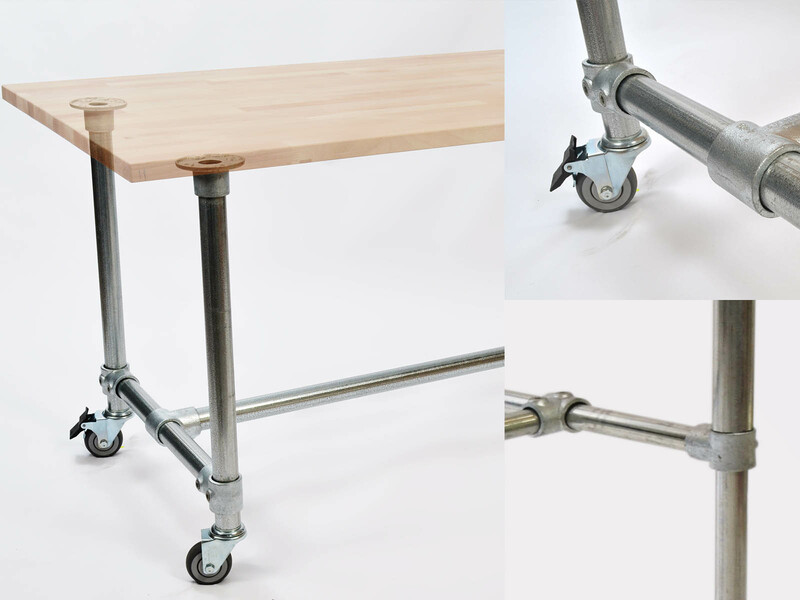 We've designed these kits after helping our customers design their own desk frames for years. Contact our design team. They'll be happy to provide you with some free assistance in building your desk. If you're looking for further inspiration, there are many other standing desks in our projects area. A few of them are linked at the bottom of this blog post. The rest can be accessed in the Table and Desk category of our projects area.